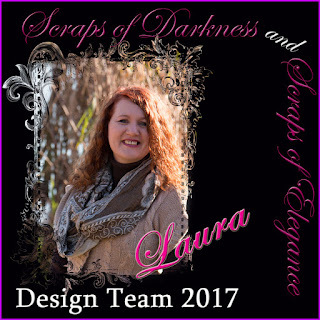 Here is my next layout using the Scraps Of Darkness 'Attic Finds' kit! This wonderful paper does not scream 'baby girl' layout but I could picture it. I know I don't normally create two page albums but since this is for my great niece's baby album I thought it would go well! This little cutie and her daddy are such a sweet pair! I fussy cut the banner from one of the papers and used it to tie the two pages together. I also cut out one of the doors as an accent on the first page! The title is also a cut out! I sprayed the doilies with Tim Holtz Tarnished Brass Distress Spray Stain from the color add on. I used flowers from the main kit, floral add on and previous kits! WOW! WOW! WOW! Awesome! Both pages are stunning, I really love the 2 page! I am glad you made the 2 page, because it is really beautiful!